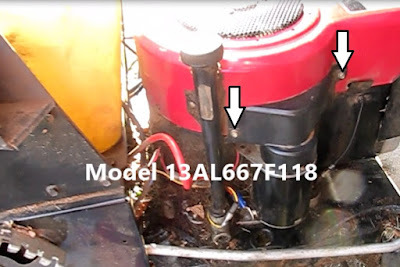 This post details how to troubleshoot and replace the starter on an MTD riding mower model 13AL667F118. This procedure would be similar on many other brands of riding mowers with Briggs and Stratton engines, such as John Deere, Cub Cadet, Toro and more. This is not a difficult job. Tools: 1/4", 7/16" (or 11mm) and 1/2" socket and ratchet or wrenches. 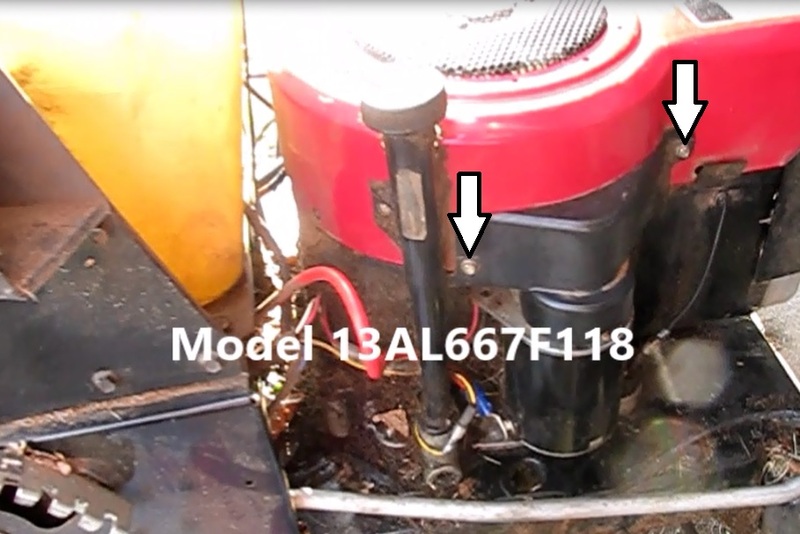 The starter is located on the right side of the Briggs and Stratton engine. 1) Remove the plastic cover for the pinion gear. It is held on by two 1/4" hex head screws. 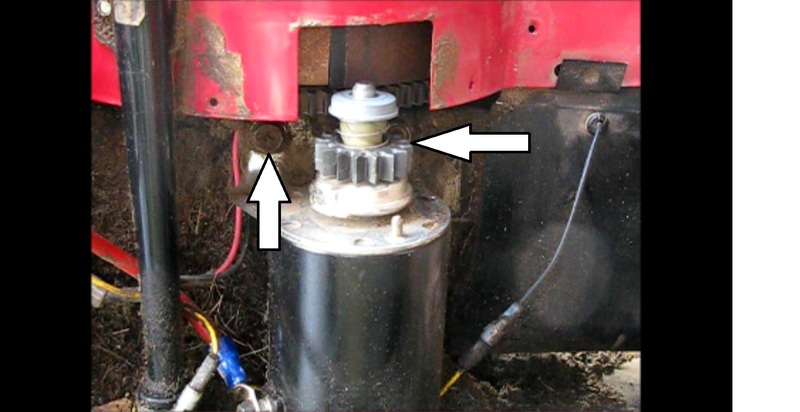 2) With the cover off, try to start the engine and watch for movement of the pinion gear and turning of the flywheel. If the gear moves upward but the flywheel doesn't turn, there may be an engine problem, perhaps even a seized piston. If the starter turns the engine and it won't start, the starter is good. 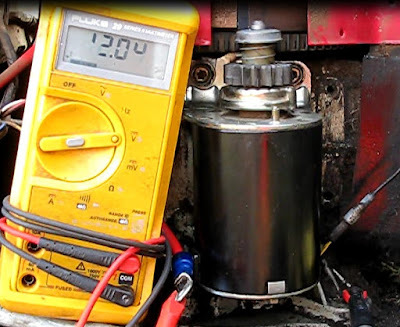 If the starter appears to be dead, move on to step 3. 3) Unwire the red power (B+) cable from the starter. This wire is not electrically hot until the ignition switch is turned to the start position. It is held on by a 7/16" (11mm will also fit) nut affixed to a stud on the side of the starter. 12V present at the lug: Unless the engine is seized, the starter is faulty and needs to be replaced. 4) Unbolt the starter. 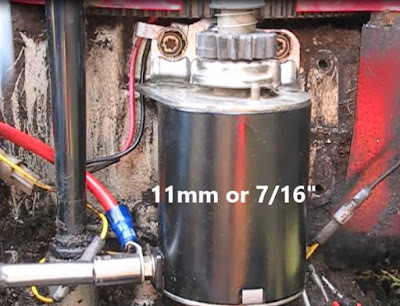 Use a 1/2" (or 13mm) socket to unbolt the starter from the engine. There is a bracket on the left side bolt that is used to as a wire guide. Note the routing of the wire before removing. 6) Find a replacement motor. See the end of the blog for possible replacements. 2) Mount the power wire to the starter with the 7/16 (or 11mm) socket. 4) If all is well place the cover back over the pinion gear with the two 1/4" screws.